Do you have a beginning basketball player in your home who wants a basketball hoop to better their skills, learn a new shot, or practice at the foul line? For the beginner player with a budget in mind, a portable basketball system that is worth a look is the Invader portable basketball hoop by First Team. You’ll receive a quality yet simple portable hoop for a lower price than many other hoops, and your beginning player will have a great opportunity to use a great hoop to hone their skills. Being a base-level hoop, the First Team Invader Portable Basketball Hoop has some basic features, but not so basic that they will affect or decrease your satisfaction; younger players will have no problem enjoying everything that this hoop offers and their parents will enjoy the low price point as well. The Invader boasts a 44 inch acrylic backboard; the acrylic allows for a stronger surface than the more typical polycarbonate backboards. The backboard is also weather resistant, so leaving this hoop outdoors through various types of weather will not crack or warp it. One low point of the backboard, however, is its size. The 44 by 33 inch size is smaller than many other backboards on the market and it give a smaller shooting and rebound area than other similarly priced hoops with bigger backboards. There is also evidence of vibration off the backboard which can affect shots as well. The backboard size may not be a deal breaker for a younger, beginner player, but is something to keep in mind when purchasing a portable basketball hoop. When it comes to adjusting the hoop height, the First Team Portable Basketball System makes things pretty easy. Thanks to a crank adjustment system, the hoop can raise from 7.5 feet to 10 feet in an easy motion. Reviewers found it to be easy to raise to accurate heights, and the adjustor is made of strong, durable pieces that many found sturdier than other hoops’ handle-type mechanisms. The three piece power lift pole is 3 inches in diameter and along with the crank mechanism, allows you to find the perfect height for your game and lets it grow with your player as they grow. The base of a portable basketball hoop is always an important factor, as you want your hoop to withstand games, practice, and weather conditions without tipping or leaning. The First Team Invader features a 33 gallon plastic base, giving players a solid foundation to withstand movement of many types. The base can be filled with water or sand for additional weight and stability, and gives parents some piece of mind not worrying about the hoop tipping during play or rough winds and weather. While the base is quite sturdy, it doesn’t neglect being portable as well; the base contains wheels that allow the hoop with an empty base to be easily moved to a different location for play, or into the garage for winter storage. 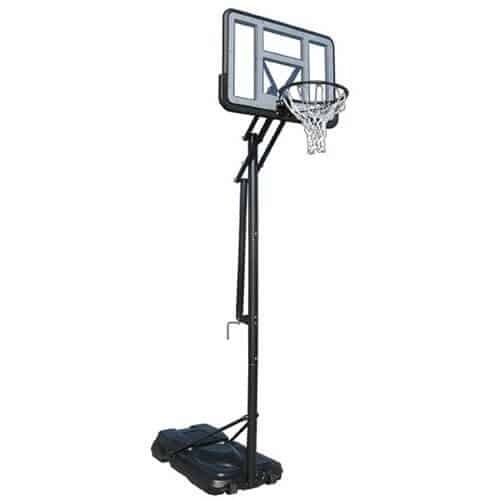 Even basic portable basketball systems should allow for tough games, hard shots, and solid slam dunks; the First Team Invader doesn’t leave you lacking in any of those areas with its Flex Breakaway rim; it allows players to go up for a dunk or rebound without much worry about bending or breaking the rim. A backboard frame goes around the bottom of the backboard as well for a bit of protection when taking it to the hole. A great feature as well is that the Invader has less offset from pole to rim, so it is perfect for those with tight spaces or a small driveway on which to play. You won’t have to sacrifice quality even though your playing space might be smaller than you like. The First Team Invader portable basketball system is a good choice for beginning basketball players. However, we find that around $400 this basketball hoop is overpriced. Assembly of the Invader appears to be fairly easy compared to other competitors, and First Team has a great customer service department to help you with any issues that may arise in the assembly process and beyond.